Available now from IDEC , RSC series solid state relays have technology to dissipate the heat away from main switching components, making them a great buy. 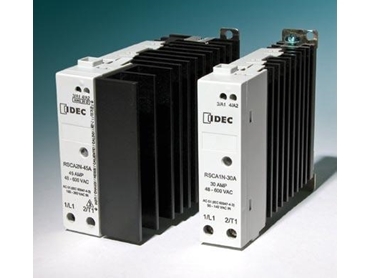 Other solid state relays may require the user to add their own heat sink or deal with a burned out product, but the new RSC serie solid state relays from IDEC have a built-in heat sink making them easy to install and get running. The built in heat sink, along with an epoxy-free design, eliminates the need to de-rate the solid state relay and also increases its life expectancy. Furthermore, an LED status indicator makes sure the user can see it working. The slim design of these RSC series solid state relays provides a compact unit for DIN Rail or panel mounting without wasting space. Solid state relays with 20A and 30A current ranges are 22.5mm, while the relays with 45A current are 45mm. All RSC solid state relays are UL recognized, CE marked, as well as being lead-free and RoHS compliant. EMC (Level 3) and IEC 62314 compliant.